Playground Committee Adult Social @ Magerk’s Pub! EEHSP is pleased to present origami artist April Zay, owner of Hummingbird Arts Studio, as the 2019 Artist-in-Residence for Erdenheim! 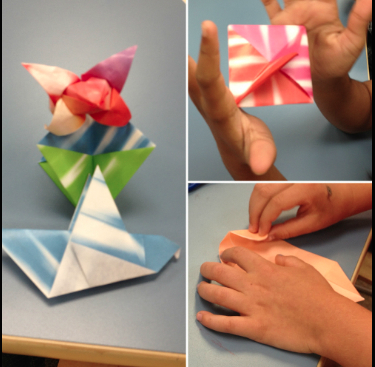 April will guide students in creating three pieces of origami, the Japanese art of paper folding, and teach them about the history of the art form and how it relates to math, science and social studies. The students will be able to bring home 1-2 pieces, and 1 piece/student will be incorporated into a group art project to be displayed at Erdenheim and in the community. April will be at Erdenheim from March 1 – 8 and she’ll be working with the students during their regular art class time. We’d like helping hands for this project so please use SignUp Genius to find and register for the time and date for your child’s class. Clearances are required for this activity! Thank you for helping to make this project possible.